Sensaphonics has added three audiologists to its exclusive Gold Circle network, including the group’s first Brazilian member. 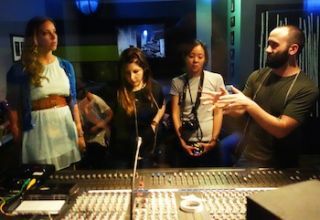 In the control room at Chicago’s Mystery Street Recording Company, Sensaphonics audio engineering consultant Joe Tessone (right) instructs new Gold Circle audiologists (from left) Rachel Pizarek of Weill Cornell Medical College, New York City; Melissa Wikoff of Atlanta Hearing Associates; and Karina Otubo of São Paulo, Brazil. The two-day Gold Circle seminar includes in-depth teaching sessions at Sensaphonics headquarters, plus a hands-on lab session with a live band, held at Mystery Street Recording Company, both in Chicago. Audiologists gaining Gold Circle certification at the seminar, held June 21-22, include: Karina Otubo, an audiologist from São Paulo, Brazil, Melissa Wikoff, Au.D. of Atlanta Hearing Associates, and Rachel S. Pizarek, Au.D., of Weill Cornell Medical College in New York City. Among manufacturers of custom in-ear monitors (IEMs), Sensaphonics remains unique in its focus on hearing health in the music industry. The Gold Circle seminar teaches audiologists the specific skills required to serve musicians and those who work around them, including the taking of ear impressions. The Gold Circle seminar is taught by Santucci, assisted by Sensaphonics audio engineering consultant, Joe “Sound Guy” Tessone. The personalized, hands-on sessions include instruction on concert sound systems, backstage etiquette, and taking proper ear impressions. The latest technology in hearing health solutions, including patented technologies like the Sensaphonics 3D Active Ambient IEM System and dB Check in-ear sound level analyzer, are also presented. The highlight of the seminar is a hands-on lab session working with a live band that is using in-ear monitors for the first time. The Ross Originals, who record at Tessone’s Mystery Street studio/rehearsal facility, were the featured performers.